A gas leak beneath westbound lanes of I-20 between Candler and Gresham, Georgia caused a section of the highway to buckle Monday morning. All westbound lanes have been closed. Motorists were told to exit the highway and use alternative routes until further notice, The Atlanta Journal-Constitution reported. One witness, Greg Phillips, told the paper he saw a motorcyclist crash when the road buckled. Crews are still assessing the damage, reports WYFF. The bump in the road is about three feet high. This is the second time a major highway in the Atlanta area has suffered some kind of disaster. 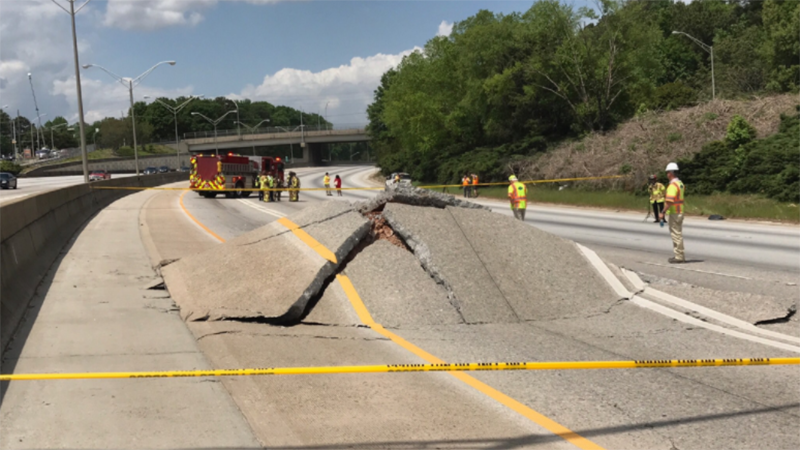 The first one occurred just a few weeks ago when parts of I-85 collapsed due to fire.